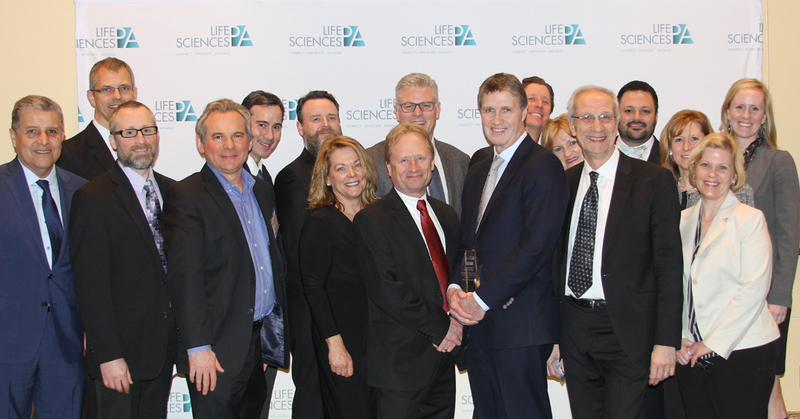 Malvern, PA, March 14, 2019 – VenatoRx Pharmaceuticals’ President and CEO, Christopher J. Burns, Ph.D., was named the 2018 "Frank Baldino CEO of the Year” award by Life Sciences Pennsylvania. The award recognizes a CEO who has demonstrated visionary leadership and active participation to advance the industry. VenatoRx Pharmaceuticals team celebrating Dr. Burns being named 'CEO of the Year' at the Life Sciences Pennsylvania Annual Dinner in Philadelphia. Dr. Burns has more than 25 years’ experience in the pharmaceutical industry including various corporate and R&D leadership positions at Protez Pharmaceuticals, ViroPharma, and Rhone-Poulenc Rorer (now Sanofi). He has appeared as co-author or co-inventor on more than 60 patents and publications and has served as Principal Investigator on more than ten awarded U.S. National Institute of Health (NIH) grants. He received a B.S. in Chemistry from St. Joseph’s University, and a Ph.D. in Organic Chemistry from the Massachusetts Institute of Technology (MIT) under Nobel-laureate Professor K. Barry Sharpless. Dr. Burns currently serves on the Board of Directors at Life Sciences Pennsylvania (LSPA) and the Antimicrobials Working Group (AWG) and was named an EY Entrepreneur of the Year Finalist in 2018. Life Sciences Pennsylvania (LSPA) is the statewide trade association for the Commonwealth’s life sciences community. Founded in 1989, LSPA works to ensure Pennsylvania has a business and public policy climate that unites and incentivizes all facets of the state’s diverse life sciences economy. LSPA represents biotechnology, medical device, diagnostic, pharmaceutical, research, and investment entities, along with myriad service providers that support the industry. Together, LSPA unifies Pennsylvania’s innovators to make the Commonwealth a global life sciences leader. For more information, please visit www.lifesciencespa.org. VenatoRx is a private pharmaceutical company that is focused on the discovery and development of novel anti-infectives to treat multi-drug-resistant (MDR) bacterial infections and hard-to-treat viral infections. VenatoRx’s lead product, VNRX-5133, is an injectable broad-spectrum beta-lactamase inhibitor (BLI) that directly inhibits all four Ambler classes of beta-lactamases, including the emerging carbapenemases KPC and NDM-1. In addition, VenatoRx has a broad pipeline of preclinical programs, including a broad-spectrum orally bioavailable BLI, a novel class of Penicillin-Binding Protein (PBP) inhibitors that are impervious to beta-lactamase-driven resistance, and novel antiviral agents. For more information, please visit www.venatorx.com.